Topics: Tennessee H, For Sale, -click Here-, We Also Sell, and From. Its 4 DNS Records include, ns9.san.yahoo.com, yns1.yahoo.com, and yns2.yahoo.com. It is hosted by Yahoo Inc (California, Sunnyvale,) using YTS/1 web server. 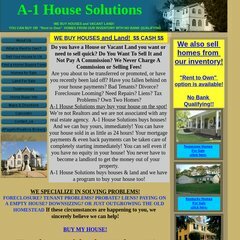 A-1housesolutions.com's server IP number is 98.136.92.206. A time of 37.1 ms, is recorded in a ping test.